Do you love quinoa? I sure do. It's so easy to cook and light on your body. Quinoa is high is fiber and protein, which is something I look for when grocery shopping. Protein and fiber keep my digestion system working well. I love how quinoa can be paired with just about anything, sweet or sour and it still tastes amazing! The mushrooms in this recipe are just so mouthwatering! Besides that, they are good for protecting your hair, skin and nails. And the amount of bell pepper in here will definitely boost your immunity and improve your vision. 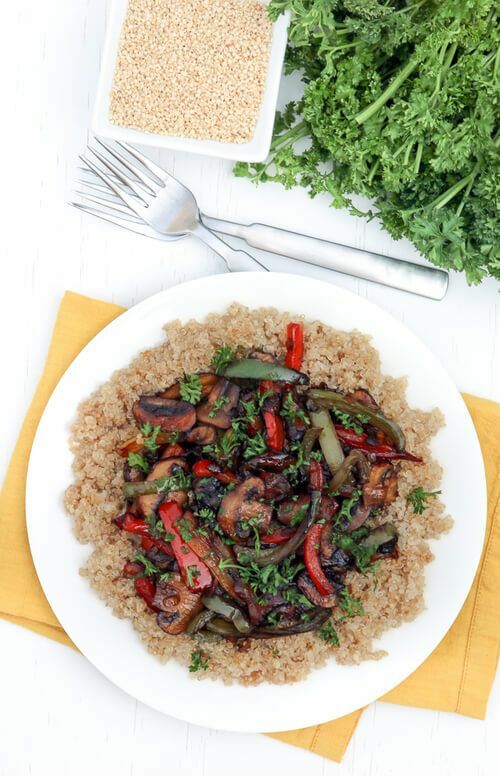 Next time you make quinoa, pair it up with this Mushroom Teriyaki recipe. Cook quinoa by adding 1 cup of water and 1/2 cup quinoa to a saucepan. Bring to a boil. Cover, reduce heat to low, add a pinch of salt, and simmer until water is gone. Fluff quinoa with a fork. Heat up a skillet and add 2 Tablespoons of extra-virgin olive oil and 1/2 pound sliced mushrooms. Chop 1/2 yellow onion. As soon as mushroom begin to darken, add in the onions. Stir and sauté for 3 minutes. Slice red, green and yellow bell peppers, add to the mushrooms. Sauté for another 2 minutes. Add in 2 Tablespoons teriyaki sauce (I use a gluten-free option). Give everything a good stir and transfer onto a serving plate along with cooked quinoa.